I usually start with a pretty after picture, but today we're switching things up! 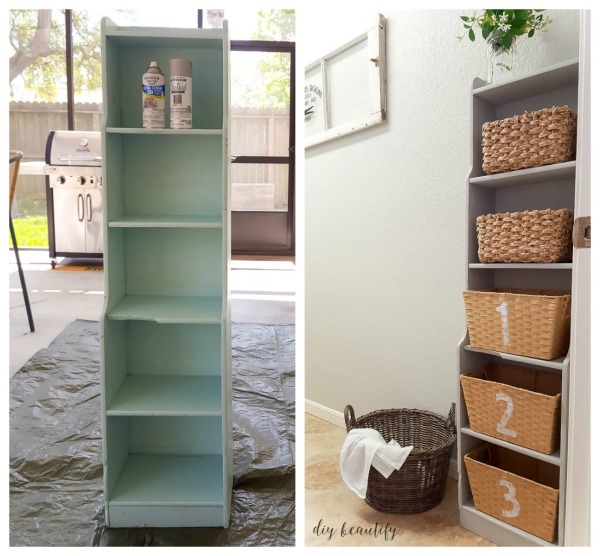 When we redid our laundry room recently (a makeover accomplished for under $100! 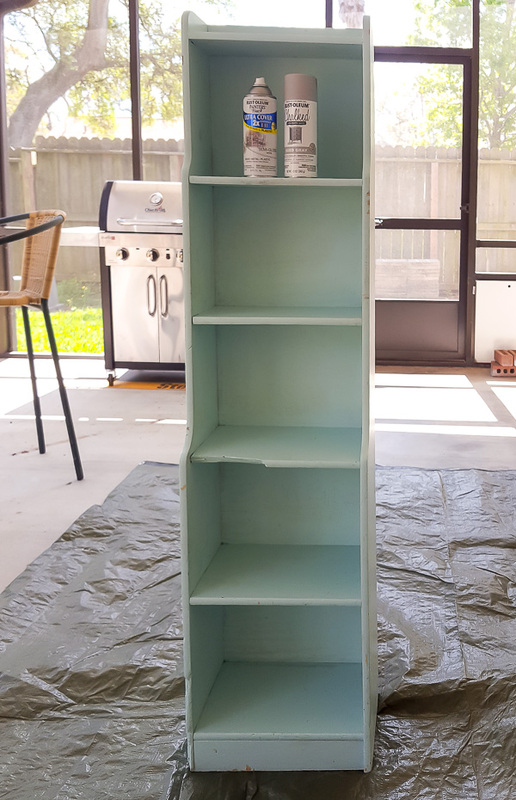 ), there was a little upright cabinet that needed some love. I purchased this cabinet years ago at a thrift store. 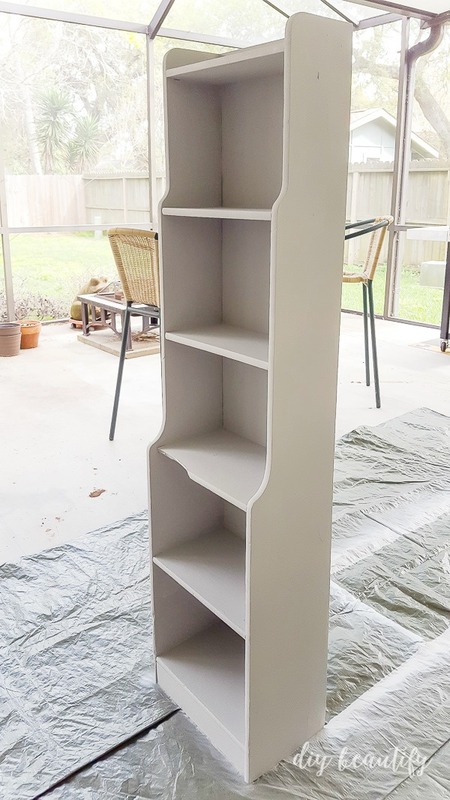 It's kind of wonky, with some water damage on the bottom shelf and another shelf that has a chunk missing. However, I liked it. I like the narrow square footage it takes up and the fact it can really be used anywhere to help me stay organized. Today I'm going to show you how I gave this cabinet a quick update with new paint and stenciled baskets to maximize it's organization. 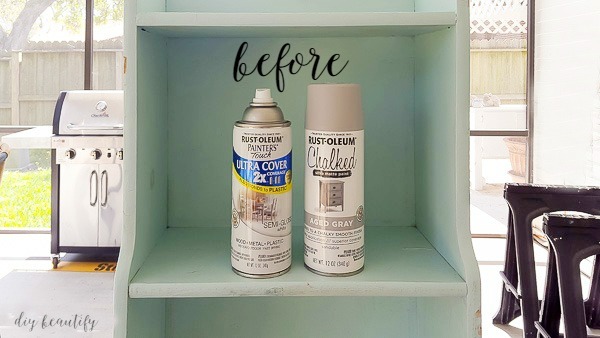 I started off spraying a couple coats of Rustoleum white as a base coat and then finished up with Rustoleum Chalked in Aged Gray. This new paint color is a much better match to the neutrals that I have going on in the laundry room anyway! After the new paint job, I took my palm sander to the edges to reveal some of the original wood. 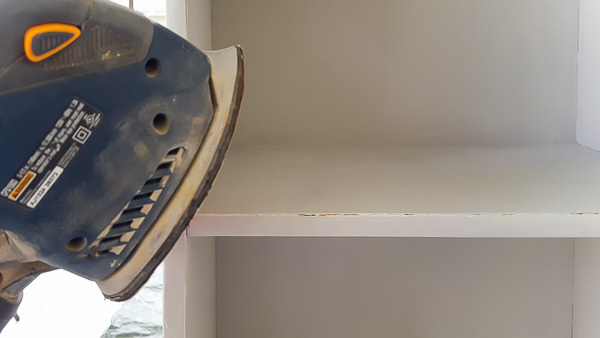 This would have been very difficult to do with a sanding sponge. When you need to get through a few layers of paint, an electric sander is much easier! After wiping off the sanding dust, I brushed on a coat of clear wax. Unsure about when to wax and when to skip it, and what types of protection to apply to your painted furniture? Read this post that explains it in more detail! Then I spent a couple days thinking about how I wanted this cabinet to function. So far, it had become a kind of catchall for random stuff in the laundry room that no one wanted to put away. I really wanted it to function better than that! I measured each shelf and headed off to Michaels to see if I could find matching baskets. I wasn't entirely successful in that I didn't find 5 baskets that matched, but I got close enough. The baskets I found are all in the same color family and they were all 40% off! I decided to go a step further and stencil numbers on the three larger baskets. I love typography and anytime I can personalize something I will! Like my labeled canisters and stenciled fishing creel. I created simple number stencils using my Silhouette machine, cut them out and taped them onto each basket. Then I lightly pounced some white chalk paint onto each stencil using a stencil brush. Lightly is the key when you stencil; it keeps the paint from oozing under the edges and gives you a clean line. 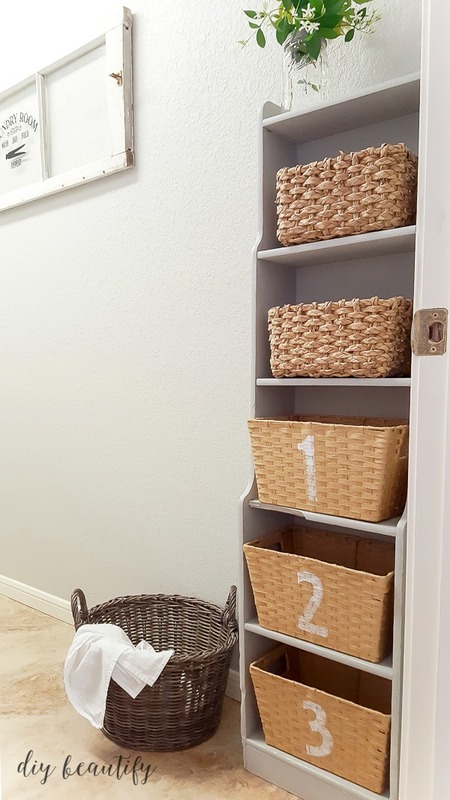 Not only is this cabinet more functional now with the addition of the baskets, but the stenciled numbers add some farmhouse charm...something I love! I'm planning to fill the baskets with a lot of smalls that always get lost in drawers. Then when someone needs something, I can easily point them to the correct basket! I'm not normally so organized, but I love when everything has a place!